"We are Métis, with roots and rights that extend 9,000 years into this continent. We are neither First Nations nor Inuit, nor are we European immigrants to this land. Instead, we are the middle-ground between camps; the compromise between differences and the dawn that separates night and day. We are not half-breeds, but the children born of a marriage between two very different worlds ... To be Métis is to be blessed with the best fruit of not one, but two family trees. We are not "half" of anything, but doubled. Being twice blessed, we are likewise proud, strong and determined." The paternal ancestors of the Métis were the former employees of the Hudson’s Bay and Northwest Fur Companies, and their maternal ancestors were Indian women of various tribes. The French word,"Métis" is derived from the Latin participle mixtus, which means "mixed" (and in French "mele"); it expresses well the idea that is sought to be conveyed. However appropriate the corresponding English expression "Halfbreed" might have been for the first generation of the mixture of blood, now that European blood and Indian blood are mixed in every degree, it is not longer general enough. The French word "Métis" expresses the idea of this mixture in the most satisfactory manner possible, and thus becomes a proper race name. We, the Métis, are a people of the lands which gave rise to our history, tradition and culture. We call these lands the Métis Homelands. These Homelands stretch from the lakes and rivers of Ontario, across the wide prairies, traversing the mountains into British Columbia and into the Northwest Territories. They include the hills and valleys of Montana, North Dakota, Minnesota, Wisconsin and Michigan. These are our lands. They are Métis lands of our past, which nurture us today and which we value as the precious foundation of our future. As Métis who live in the Homelands, we hold it to be a fundamental truth that we are one of the Aboriginal peoples of the Americas. As Métis people we joined together long ago to from a new nation, a distinct nation, which Louis Riel called the “Métis Nation”.  The Métis Nation continues today to be the embodiments of our past, our present, and our hopes and aspirations for the future. Check out the links below for more information about Métis! The paternal ancestors of the Métis were the former employees of the Hudson’s Bay and Northwest Fur Companies, and their maternal ancestors were Indian women of various tribes.